I'm pretty sure there is an app for everything now! There are so many out there but in today's post I'm going to share with you 4 apps I'm absolutely loving at the moment. In addition, I have recently received some beautiful new phone cases from Caseapp. Caseapp is an amazing website that has hundreds of phone case and laptop/mac skin designs to pick from. However the best thing about Caseapp is that there is also the ability to create and personalize your own phone case/skin on their website - which is amazing! As you can see I received two new phone cases. One is a beautiful navy tropical themed design that I gifted to my mum. When selecting your design on the website, you have your choice of phone model, plus the material of the case (e.g. matte or glossy). I was very very impressed with the quality of the phone case when it arrived as often phone cases can look cheap and bad quality which very much not the case with Caseapp (if you pardon the pun). 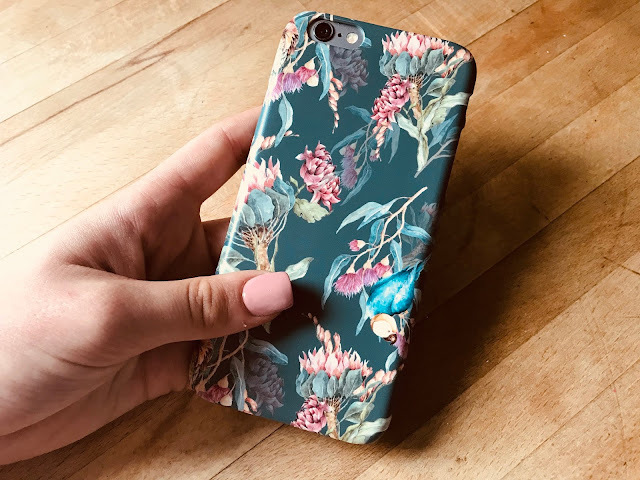 So as I said I gave that phone case to my mother, and for myself I picked out a black tropical leaf design (because I'm pretty obsessed with palm leaf print atm). With this design I had the option to customize and personalize it so I added my initials in the corner of the case for a little added touch. I could choose the exact font, colour and played around with the size and position for a while so it was exactly how I wanted it to be. I absolutely love my new phone case and will be using it for a long long time! Caseapp have hundreds of designs to pick from that are so beautiful and unique. In addition, you can also create a phone case with your own images, designs and photos which is amazing too! So get creative! In addition as you may have seen from my title of this blog post I am hosting a giveaway over on my Instagram (@bloglilyrose) where I am giving you the chance to win any item of your choice from the Caseapp website! All you have to do is follow me on Instagram here and to head over to this Instagram post and tag a friend in the post comments section below. You can tag as many friends as you wish as each friend tagged is an entry into the giveaway giving you more chances to win! Every find yourself out and about wanting to find somewhere for lunch, or a drink or something to do? Well this amazing lifestyle app recommends places near to you that are tailored to what you're looking for. You can discover new places and hidden gems right near you! You can reserve tables straight from the app and book cinema tickets too which is great, and the app is totally free to use. You've probably seen this app on Instagram but I absolutely love it! This free fashion app allows you to earn money by sharing images of what you're wearing, and other users can purchase the items straight from your image. It's a great way of being inspired and purchasing new items you see and love! The Sweatcoin app converts your outdoor steps into currency units which can be redeemed against new gadgets, sports and fitness gifts, and experiences. It's a great way to get moving, to measure your steps each day and to acquire some great gifts. Plus it's totally free to use! I absolutely love printing out photos. I'm that person at uni that has photos put up everywhere in my room. I love having albums and frames filled with photos too because I think they're great to have to look through and to look back on in years to come! Snapfish has an amazing app which is a cheaper way to print out photos. I have used it several times now and am always impressed with it. Snapfish gives you 50 free prints per month and all you have to do is pay postage. It's not a subscription so you don't have to purchase these photos every month so every now and then when I've got 50 or so photos I want to print I open up the app (which is really easy to use) and order my images. It's free to download and use so I would definitely recommend. I hope you've enjoyed this blog post. Make sure you check out all the apps I'm loving and let me know if you use any of them already. In addition certainly check out Caseapp and their amazing products. And lastly head over to my Instagram giveaway - you wouldn't want to miss out!